How does an airbag module work? If you have educated yourself on the different safety components in your vehicle, you likely learned about the SRS airbag module. If you have not, I cannot stress enough to you the importance of it for the overall functionality and safety of your vehicle. Even though it is a small component in your vehicle, it plays a big role. Let me tell you just how it does that. To start off, the SRS airbag module is a computerized system in your car. What it basically does is control the entire airbag system in your vehicle. Everything from the airbags themselves, the impact sensors, and even the seat belt pre-tensioners—relies on the module to properly function. During a sudden stop or collision, where the airbags deploy, the airbag module stores a ton of information in the form of crash data and hard codes. This information includes seat belt use, the vehicle and engine speed, seat belt pre-tensioner deployments, impact speed change, throttle position, airbag deployments, and brake light switch position. Interestingly enough, this type of information is almost always admissible in court and usually trumps other physical evidence or verbal explanations. When the airbag module is not up to par—or has all this data stored—the airbags cannot deploy in an accident. This, as a result, can potentially lead to serious injury or even death. That is why you should have the unit replaced immediately. You do not want to be endangering your own life or that of your passengers. You basically have two options when it comes to fixing a faulty airbag module. The first, and pricier, option is to purchase a brand new module at the dealer. Or, you can send in your present unit to the company Safety Restore so that they can restore it to factory settings. When resetting their SRS airbag module, many people run into the issue of their airbag module not communicating properly. This can happen for a number of reasons. Read below to find out a few of those reasons. One reason your SRS airbag module may not be communicating properly is because it is improperly grounded. This simply means that it needs to be bolted down completely in the reinstallation process. Believe it or not, this issue is pretty common. Another reason may be because of the communication pins at the plug. 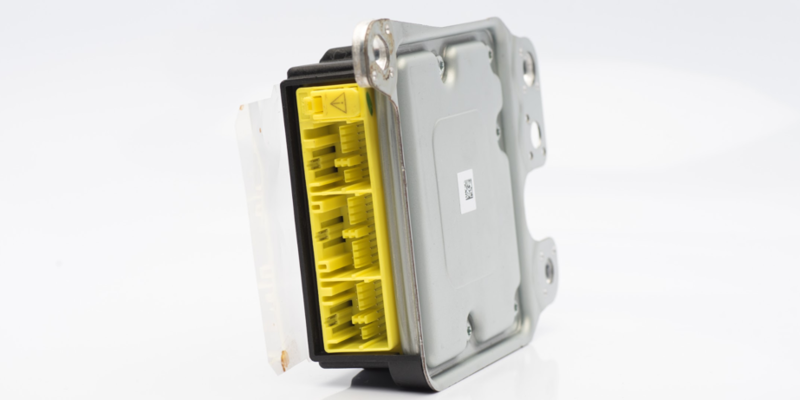 To make sure this isn’t the reason you are having communication issues, make sure to inspect the communication pins where the harness connect into the front of the airbag module. Look out for any damage or corrosion present. Sometimes, the pins can push back, bend, or even break off. 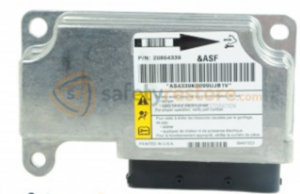 A third cause of your airbag module not communicating may be because of problems with your scanner, and not the actual module itself. To scan your airbag module, make sure that the scanner you use is able to properly read the airbag diagnostic codes. The scanner should access your airbag system and support your vehicle make and model. A lot of scanners are just set to read the basic engine codes so you want to make sure yours is set to read your codes. Also, if you have a newer car you want to make sure you are not using an outdated scanning tool. 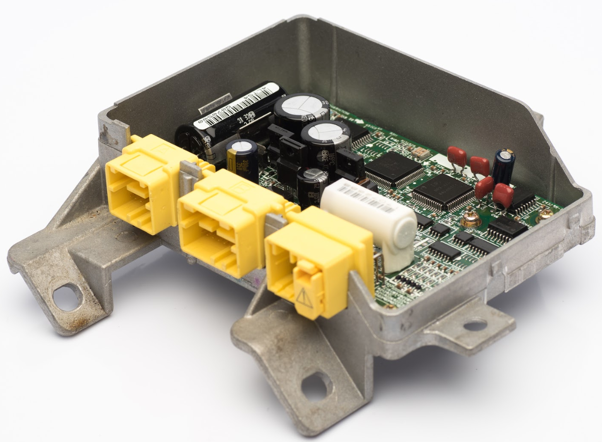 The wiring or harness can also be the reason for the issues you are having. Make sure to check that the harness or wiring surrounding the SRS airbag module isn’t cut or otherwise damaged anywhere. If you determine that all the above issues aren’t the reason for your communication problems, you may want to send your SRS module to a professional company like Safety Restore. Can you drive without an airbag module? While a vehicle can still run without an airbag module, it is strongly recommended that drivers do not operate the vehicle without it being installed—unless an emergency situation arises and there is no other option. There are several reasons for this, the biggest being to preserve one’s safety while driving. What an SRS airbag module looks like. The main reason why it is unsafe to drive without an SRS airbag module installed is because a car’s airbags will not work without them. If they do no work, then they are not able to serve their purpose as secondary restraint systems—and as a result will not deploy if an accident were to occur. As you can imagine, that can pose as a giant problem. Without airbags deploying, a driver and any passengers can face serious injury or even death. During a sudden stop or a collision, the airbags are what stop the occupants of a vehicle from crashing through the windshield or against other objects and people in the vehicle. Without airbags in the equation, nothing would be able to slow down occupants’ change in momentum and reduce the forces exerted on them. The safest bet for an owner of a vehicle that needs their SRS airbag module replaced is to have another form of transportation ready for the time it takes to reset or entirely replace the unit. Although it may be a hassle to do so, it is better to be safe than sorry. The great thing is that there is a company—Safety Restore—that is able to reset airbag modules and only takes 24 hours to do so. For that short amount of time, arranging another form of transportation shouldn’t even be a problem. Not only will it take a short amount of time but it can also save a driver hundreds or even thousands of dollars compared to the prices at the dealer! What does the Airbag Module do? We all know that there are certain components present in a vehicle that aren’t necessary for it to run, but that would behoove us to use for our own safety. Take turn signals and seat belts for example. Sometimes, we may not realize these different parts are even there. However, even if they are small components, they serve large roles. They drastically improve our overall safety while driving. One such component is the SRS airbag module. What does the SRS airbag module do? So what exactly is an SRS airbag module? The SRS airbag module is a unit that controls the airbags in your vehicle. Everything from the airbags to the impact sensors to the seat belts go through it. Oftentimes, it can be located under the driver’s seat. Its main job is to monitor your car’s sensors constantly and record the information in a file. When a collision occurs—even a minor one—the sensors awaken the module to store the information in the form of crash data and hard codes. Information can be stored even up to 8 seconds leading up to the accident! At times, safety belts may deploy as well, which results in additional codes being generated. This in turn causes your dash to display the airbag light. 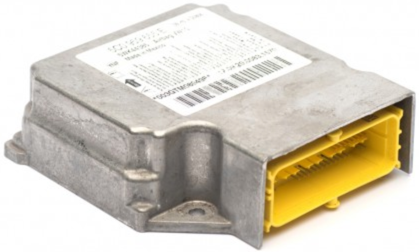 A few valuable pieces of information can be obtained from what the SRS airbag module stores in its system. The first would be the speed of the vehicle when the crash occurred. The module also records whether or not the brake light switch was activated during the impact. The engine speed along with the throttle position is also found among the information stored in the unit. Airbag modules in some vehicles also record seat belt use, any airbag deployments, safety belt pre-tensioner deployments, and impact speed change. If you were involved in a car accident, you should get your SRS airbag module reset immediately by using our service here. The company Safety Restore can perform an SRS airbag module reset for you and bring the unit back to factory settings. That way, it can be available and working like new if any additional accidents were to occur in the future. The company guarantees quality and safety and you’ll have a lifetime warranty to go with it. Need an SRS airbag reset but don’t know who to turn to? The perfect company to do this for you is none other than Safety Restore! Safety Restore has held a successful and positive reputation for years when it comes to the repair of seat belts and SRS airbag resets. They have amassed quite a high positive review count to show from it. Just looking at the foundations of the company can draw you to see the quality–and safety–that they ensure in their services. Since the beginning, Safety Restore has only employed highly trained and experienced seat belt engineers. Repairs have always met or exceeded FMVSS standards. Additionally, only 100% OEM parts and industry standard tools are used in their work environment. Safety Restore works with customers throughout the country–even overseas–and welcomes all makes and models of vehicles. A quick 24 hour turnaround time is guaranteed to all customers, regardless of the amount of items being sent in for repair. Busy automotive shops have found this especially gratifying. Furthermore, the prices are unbeatable. Rather than spending hundreds, or even thousands of dollars, the most a customer will spend per item is $114.99 at Safety Restore. Getting an SRS airbag reset comes up at only $49.99! Plus, a lifetime warranty is added to all services completed by the company! If there ever was a bargain, this definitely is one! As the SRS airbag module is such an important safety element in the vehicle, Safety Restore makes sure to restore it to its full potential. When performing the SRS airbag reset, the technicians remove all hard codes and crash data that have been stored in the system after an accident. Everything is restored to factory condition and no additional programming is necessary after that! Also, the annoying airbag light that turned on as a result of the accident immediately goes away after Safety Restore has performed its work on it! To get the SRS airbag reset, simply log onto safetyrestore.com, select the SRS airbag module reset service, and pre-pay for it. Then simply remove the unit from your vehicle, box it up, and ship it out to Safety Restore in Westfield Massachusetts using any preferred carrier. In just 24 hours of receiving your unit, the technicians will erase all hard codes and crash data and ship your package back out to you! What could be easier and faster than that? Safety Restore Saves a Life! Mark owns a shop in Hallandale Beach, FL and has been using Safety Restore for SRS airbag module reset services and seat belt repairs. As any customer, skeptical at first, but upon research has made Safety Restore his only loyal repair company for post-accident restorations. However, it wasn’t until recently that his confidence has been confirmed on a whole new level. A vehicle he has just finished for a customer that has been involved an an accident and needed the airbags replaced as well as the seat belts rebuilt. The customer picked up the car and his 21 year old daughter has sat down behind the wheel of the Honda. That drive ended in a catastrophe, for the car. The 21 year old daughter survived the crash as the airbags and the seat belts saved her life! The very same seat belts repaired by Safety Restore from a previous crash, all controlled by the SRS module that was reprogrammed by Safety Restore – erasing crash data and hard codes. Mark witnessed the entire unfolding of the story first hand and knows he can trust Safety Restore for all of his repairs now. He is sharing the heart-warming testimony on social media online, SafetyRestore.com website, Google and all of his friends and co-workers. Here at Safety Restore, we are proud. Proud that we have never compromised safety by taking any shortcuts whatsoever. Countless customers attempt to repair seat belts on their own and then mail them in thinking the damage can be undone – it cannot. Seat belts that have been tampered with cannot be repaired! Our Quality & Safety Department will never take a chance either. If we cannot safely repair a seat belt after accident or reset an airbag computer back to its factory condition, we will issue a full refund and disclose this to the customer. Safety is our #1 priority. Our competitors try to take shortcuts by using counterfeit parts, carry out the repairs without proper training and unfertilized facilities (usually at home) and always trick the airbag system using resistors in seat belts and bypassing factory programming in airbag modules. Safety Restore has never, and will not ever do this. All locked and blown seat belts after accident are rebuilt using 100% OEM parts by experienced technicians. At the end, you make the call and we really hope you’ve done the research! We are a repair facility, providing affordable airbag module resets and seat belts repairs to customers nationwide! We work with customers who work with salvage cars and vehicles that have been involved in a crash or an accident. If the airbags deployed, we reset the SRS module, clearing crash data and hard codes as well as rebuild locked, stuck, blown and non-retracting seat belt retractors, pretensioners and buckets. We offer a 24 hour turnaround on all of our repairs using 100% OEM parts that come with Lifetime Warranty. Looking to save money with our guaranteed service? Watch this helpful video explaining how our service works and save!